I assume something similar to the Outlook add-on, where you can save emails directly to Evernote from gMail. Is that what you have in mind or something different? This is a must for sure. Any word on if they plan on adding it? It's so easy to use the "Mail to Evernote"-fuction, so I don't need a gmail add-on. I used the Mailbutler predecessor Evermail, until they killed and replaced it. My current solution is scripting (Mac). This lets me customize the result, appearance, tags etc. The "Save to Evernote" function on the new MailButler doesn't work for me - it stopped working some months ago - it was the main feature I had purchased mailbutler. I am windering if anybody else is experiencing this and if you know of a work around solution: is the problem related to a change on Evernote or is it just a poor job by MailButler? There is a newer Mail plugin that (as of Mojave) still works with Evernote. The Mailbutler exporter plugin was officially updated to support Mojave. Got a DM from them on Twitter with the download file. The updated file should be linked through this article. 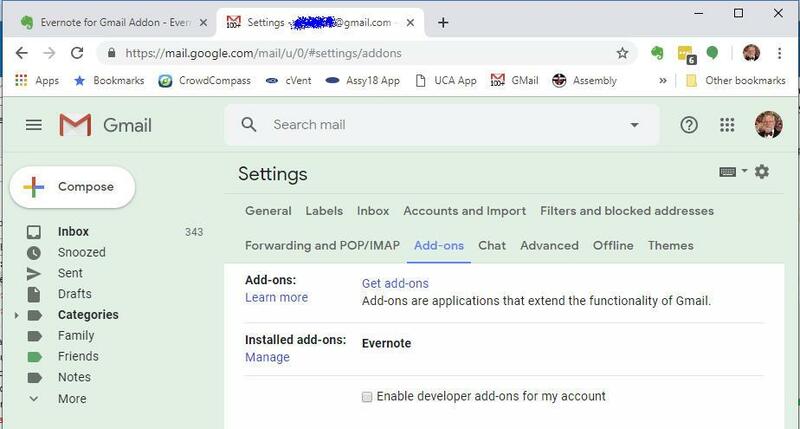 I would like an Evernote Add-on for Gmail that functions just like Google Keep, meaning that my Evernote notes would appear in the collapsible right side panel in the Gmail. Is it just me or is the add on for the android app painfully slow? It takes a good 3 seconds to load the options after I clicked the elephant. @Jim Finn You can do that now. After opening the Evernote GMail addon, Click on the "..." menu next to the "X" and select "Settings". Then, enable "Show messages in thread". Click "Apply Changes." Then click the left arrow to go back to the previous screen. You should now see an entry for "Conversation" and should say "1 of X messages." Click "Edit" and select what messages you would like to clip in the conversation and click "Apply changes". This should then clip all the selected messages to the note. I personally think this is too complicated and will pass on the information to the team so that they can hopefully surface this information better. However it comes across as very unweildly with a lot of extra steps and I am struggling to see the advantage of using this add on over the web clipper or just forwarding to the evernote email. I agree about it being unwieldly. But it appears that you only need to enable it once and then it should always appear on the first screen. I followed-up with the dev team and here's what they told me: In general, clipping multiple emails in a thread is a bad experience. This is due to each message in a thread often contains all previous entries in the thread as well (due to email clients defaulting to "quoting" the previous email). So clipping multiple messages just ends up with lots of duplication in the Evernote note. Also, it quickly balloons the size of the resulting note, which slows down the save, making for a bad experience for our users. So ultimately, they decided to not show the option by default, but allow it to be discovered and enabled for those seeking the option. Super handy being able to add notes to email though, both on desktop and mobile (iOS). A bit confusing that the ”add Evernote note” function in the compose window on iOS is under the three-dot menu, while the ”create note (clip)” is accessed with the icon (and that it is all the way at the end of the emails... scroll scroll scroll...). On the desktop both features are accessed via an icon. From the number of comments on the Add-on page there is clearly a problem for some users. I am one! 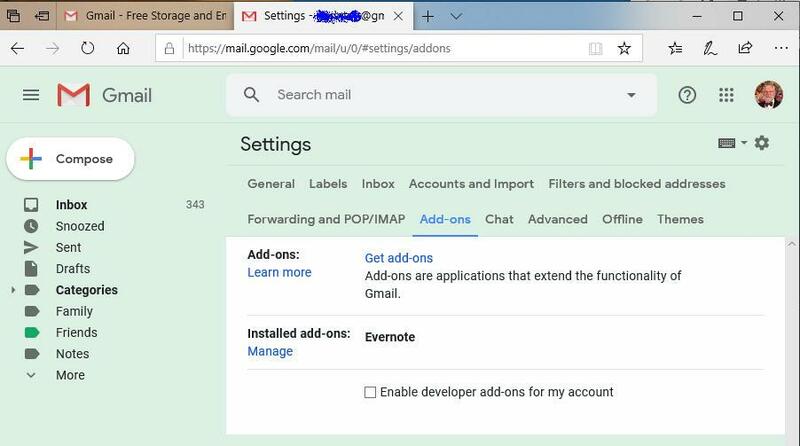 The add-on appeared to install, and is listed in the Gmail-Settings-Addons page, but there is no icon showing on the mail page(s). I have followed one comment suggestion that I close and restart the browser, but still no change. I would think it was just me, but there does appear to be a systemic problem. I just tried using it in Safari on my Mac. If you have more than 25 notebooks, paging through them is kind of tedious. Adding tags is a little clunky. The first time I tried using it, I selected a bunch of tags and clicked back. That wiped out all of my tags. I assumed the Save at the bottom was to save the email, not the tags. @ggrinton Thanks for letting us know. Any chance you could provide a screenshot of what you're seeing? Does the behavior change if you try using a different Web Browser? @Shane D. Thanks for picking this up. The behaviour (ie, no sign of any icon) in both Chrome and Edge on my Windows 10 Pro Version 1809. Attached images are for Edge and Chrome, showing the mail page and the Settings-Adding page. When viewing an email the options shown are the normal ones (image not uploaded by I can if you want).